If you’re an iPhone user with friends on Android devices, you’ve probably seen their super-slick google maps with turn-by-turn directions. Since the google maps app on iPhone will probably *NEVER* get updated to work the same as it does on android for obvious reasons, you have to look elsewhere for turn-by-turn directions. I’ve gone down this road in the past, and not found anything free worth using in the app store, but that changed recently. Remember MapQuest?. . . you know, that site you went to for directions online before google maps existed? 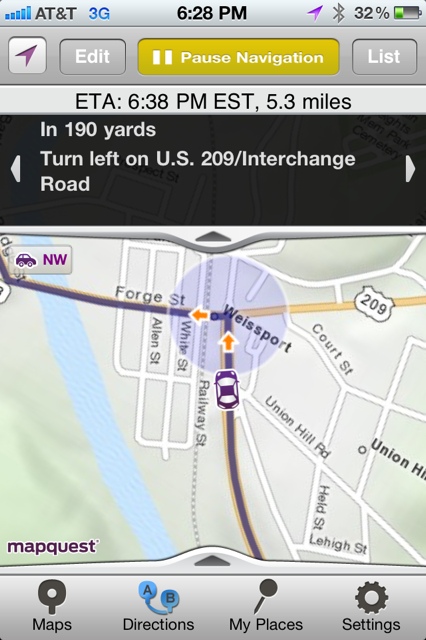 Well, MapQuest has an iPhone app out called “MapQuest 4 Mobile”. 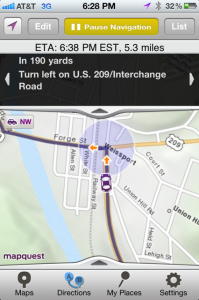 It’s 100% free, gives turn-by-turn directions both on screen and via voice, and recalculates when you miss a turn. I tried it on my way home a few days ago, and it worked perfectly. It *does* like to eat the battery, as any GPS app does. I left work with ~45% battery, and got home with ~30%. My drive is 35 miles and usually takes just under an hour, so 15% loss isn’t terrible I suppose. If you have an iPhone, I strongly suggest you give it a try.